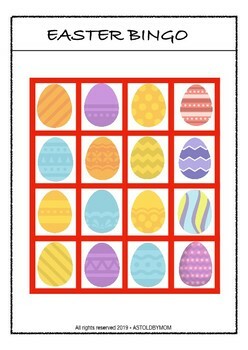 an Easter Bingo Sheet of different Easter Eggs. Once you download and take prints you can also get the Bingo sheet laminated. And stick small velcro stickers on each egg of the sheet. And then you can paste the velcro dots at the back of each individual egg to be stuck to this sheet. Cut these color marked Easter Eggs from Page 2 and 3. And now hide these easter eggs in 2 different Sand Pits for both the teams or hide them just like a Treasure Hunt. Now ask kids to find their corresponding colored egg and bring it and place it on the Bingo Sheet. Whoever finds and completely matches an entire Row or Column by their team colored eggs wins the Bingo. If no one does, the team with maximum color on the sheet can be declared as winner. 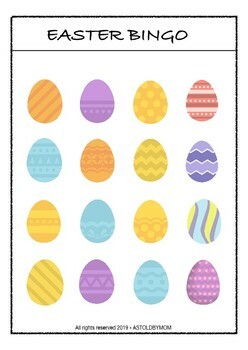 Now ask kids to find their corresponding colored egg and bring it and place it on their Bingo Sheet. Whoever completes an entire Row or Column first in their sheet wins the category 'First Row Done' or 'First Column Done'. And kids go on finding all the remaining eggs and the team who completes and matches all the eggs correctly on their bingo sheet first, should say Bingo and wins the game. PS: If the team does a wrong matching of any egg, the team will be disqualified.